We had a family lunch at Mifune, my old Japantown standby. O got the bullet train bento with rice and tempura. I ordered chicken kushi katsu for Z - she will never turn down any kind of deep fried chicken, and this had the bonus of being on skewers. (for the record, she ate it all, one for lunch and the leftover two for dinner) I had the tamago donburi, though I really wanted the oyako or curry, and D got the seafood soba soup. For dessert, we strolled to May's Coffee Shop and got a couple of chocolate filled taiyaki. 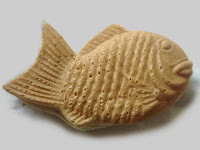 Taiyaki, for those of you who aren't familiar with it, are essentially pancakes filled with red bean paste, chocolate, or any number of fillings. O, to my surprise, was completely disinterested in his, but Z, who has had them in the past, ate hers with great gusto. She also watched one of the women behind the counter mass produce taiyaki. We got as far as watching the batter being poured into the line of pans before Z wandered off. We paid an obligatory visit to the Sanrio shop but didn't buy anything - recession budget, you know - and admired some of the anime and tchotchke laden window displays elsewhere. Times like this make me happy.